The first ripe tomatoes have started popping up at the farmer’s market, which means it’s time for a big, beautiful salad! We’ve used grape tomatoes here, but any small variety would work perfectly. They’re layered on top of crunchy lettuce dressed with our Garlic Gold® Red Wine Vinaigrette, alongside crispy bacon bits, juicy chicken, crunchy sourdough garlic croutons, and tender kernels of fresh corn for an unbeatable summer meal. To cook the chicken: Season the chicken tenders with salt and pepper to taste. Heat the Garlic Gold® Oil in a medium (10-inch) nonstick skillet over medium heat. Cook the chicken tenders until golden brown and cooked through, flipping once during cooking, about 10 minutes total. Remove from heat and let rest for at least 10 minutes before slicing into bite-size pieces. To make the croutons: Preheat oven (or toaster oven) to 350ºF and line a baking sheet with parchment paper or aluminum foil. 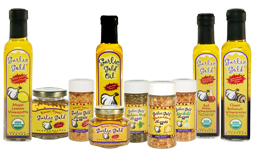 In a ziplock bag or large mixing bowl, toss the sliced sourdough bread with the Garlic Gold® Oil and Sea Salt Nuggets. When the diamonds of bread are evenly coated, spread out on the cookie sheet and bake until golden brown, about 15 minutes. Set aside to cool. To assemble the salad: In a large mixing bowl, toss the romaine and iceberg lettuce with the Garlic Gold® Red Wine Vinaigrette. Spread out onto a large serving platter. 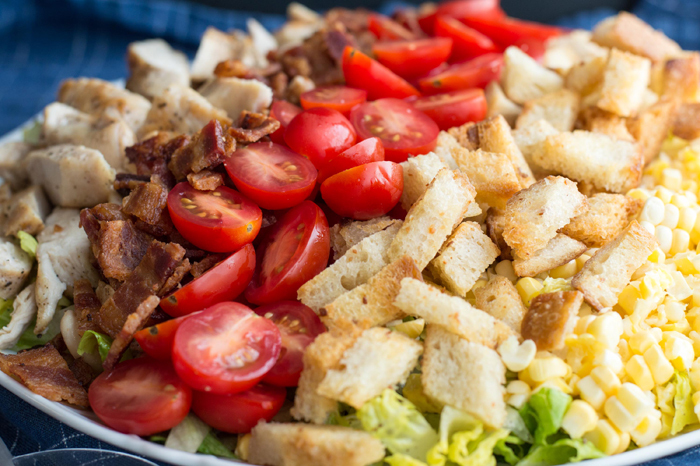 Top with rows of chicken, bacon bits, tomatoes, croutons, and corn. Toss just before serving.